The recently remodernised Residence Baia di Sorgeto, is situated amongst the lush green vineyards of Forio di Ischia. 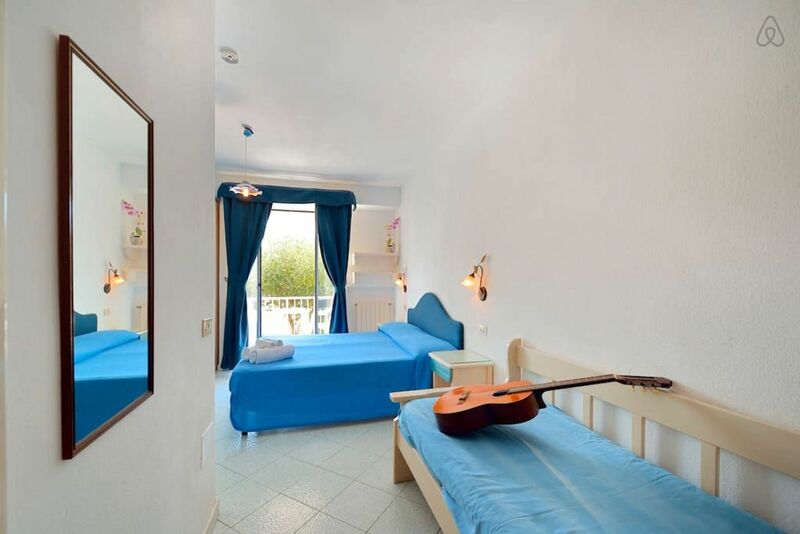 It is conveniently located 1.5km from Sant'Angelo, 800 meters from shops and bus stop, and just a small walk away from winding steps, which lead, down to the Bay of Sorgeto. The bay is rich in hot thermal springs in the Med Sea so one can bathe in the sea even in Winter!! The studio contains a self-sufficient cooking/ kitchen area with cabinets, ample supply of kitchen utensils: including fridge, plus anything else you could possibly need to use during your stay. The studio also contains orthopedic bed and mattress, an ensuite bathroom complete with shower. All room has either a private balcony or patio with small garden and stunning views of the Island. The island of Ischia as seen in the new Talented Mr Ripley and Avanti- better in life!!New! We can also offer you now a covered thermal-pool with hydromassage, usable all year long. Hot Tub in the Sea! : In some places of the Sorgeto Bay, the sea is so hot that it would be possible to boil eggs (no exaggeration!). One of the bays is just a 10 minute walk from your accommodation, where you can have a dip in the sea, which feels like a hot tub! And there’s more, if a tufacean stone is scratched, a mud can be obtained, which can be used for making a beauty mask for the face. Local supermarket purchases may be delivered to the apartment free of charge. There is an Internet point and fax service at 800m. Car, scooter and boat hire all available locally also. Diving courses are available in nearby Sant'Angelo and Forio. Personalised boat tour of the island. Characteristic restaurant nearby apartment. Thermal Spa-Pool Gardens: The Island of Ischia is scattered with natural- thermal spring pool gardens. These gardens have a mix of different types of pools, filled with the natural spring water from the Volcanos on the Island. The pools range from cold to hot tub temperature and have no chlorine. There are large family pools to small 2 person romantic pools with the cosiest grottos and the most amazing views. The caves in the walls of the volcano’s are used as natural saunas and there are massage and beauty treatments available also. We can arrange discounts on entrance costs to the thermal gardens. Island of Capri: Capri is a 40 Minute hydrofoil ride away from Ischia. Capri is one of the most stunning Island and is full of adventurous things to do and see. These include the cave grottos, like the grotto Azzuri (blue cave), which you can only get into via row boat and by laying flat on your back to go inside and when there you will experience the most amazing clear blue in the water that it looks as if there are lighting special effects inside. Also, the famous fangoli rocks and the funicolre, which is like a monorail going to the top of the island to where your disembark to an open piazza with narrow little roads full of designer clothes shops and small classy bars/ cafes. Capri is an absolute must to visit. On the swimming pool terrace you will find parasols and sun-loungers and a large table for family gatherings etc... Please note- the rooms are to be used by customers who have booked in. Please do not bring any other guests who have not booked in with us, to stay in the room. From the minute we arrived at Residence Baia di Sorgeto we felt welcomed, relaxed and peaceful. Peppino, Rosa-Thea, Claudia, and Miguel, made our stay absolutely wonderful. The apartment was very comfortable and clean as was the whole complex. The thermal pools were fabulous - i have never been anywhere where you can get straight into the pool without flinching!. The indoor spa pool was the temperature of a hot bath -amazing. The village of Panza was about 800m walk away up a steep road - it was great to walk there early evening to have an aperitif (Aperol Spritz!) at the local bar on the square and soak up the atmosphere! There are a couple of supermarkets and fresh fruit/veg shops in the village so self-catering is no problem. There are also several restaurants in the village and close to the complex and a lovely beach bar open for lunch. They served the best bruschetta of the holiday! The thermal pools at the beach were unbelievable - in fact I nearly scalded my feet on the rocks getting to them - beach shoes are probably advisable! We didn’t hire a car on this holiday - the bus service on the island is really good so we made use of it. The buses do get very busy though so be prepared to stand! We will definitely return to explore this lovely little island - hopefully next year. We have lovely memories! What a fantastic location and host. We had a really relaxed holiday – swimming in the thermal pools at the hotel, and going to the bay of Sorgeto every day (by foot), to rest in the sea water heated by the volcano. Peppino - is the man! Great host, will do anything for you. He speaks English well. We had no problems at all with the room - it has what you need to self-cater. The local town Panza, whilst it is a walk up the hill, has everything you need food wise. From here the buses are available to the rest of the island. There's a place a few yards from the hotel where a lady makes homemade lemoncillo and red wine, which is very drinkable. There also restaurants which you can walk to , if you don’t fancy cooking in the apartment. Thanks Peppino, for a lovely relaxing holiday - we will come back without a doubt. A truly amazing authentic Italian holiday. Me and my partner had 18 lovely days at Baia di Sorgeto in Sorgeto, where we were met by the lovely owner Peppino and his family. The apartments are set in a beautiful rural Italian location, which has two thermal pools set amongst a lovely garden, which includes Peppino herb garden, in which he will encourage you to use. From the outdoor thermal pool ( A lovely green in colour) is the view of Sant’Angelo, this amazing place can either be reached by your own transport, a nice walk through vineyards and cobbled streets or by boat taxi from the Bay of Sorgeto (5€ each). The accommodation is lovely and comfortable and if you needed anything Peppino and his family were always there to help, whether you wanted somewhere to eat or maybe visit other parts of this amazing island, nothing was ever to much. We both enjoyed our conversations with Peppino who is always helpful and friendly. The outdoor pool is amazing with no chlorine, so the water is a natural green in colour. Peppino adds fresh thermal water a few times each day from the thermal spring deep inside the ground, which keeps the pool lovely and warm. The separate indoor pool/spar is lovely and warm as well. The village of Panza is up the hill where you will find some good restaurants and local produce ( meat, fish, bakery and vegetable) there is also a good bus service that goes around the island from here. We found that getting around the island was made easier by riding a scooter for a week which Peppino gladly arranged for us. The local buses are plentiful but can get really busy, also there are plenty of taxis which again, Peppino will arrange for you. We had a few boat trips to the Amalfi coast ( Sorrento, Positano and Amalfi ) where we caught the boat from the port of Forio, these place are beautiful to visit. The hot springs in the Bay of Sorgeto are 10 minutes walk away, down hill and steps, where it you can find a couple of lovely restaurants, Da Gisella is a good restaurant nearby with a big balcony overlooking the Bay of Sorgeto. If you want a truly Italian holiday, this is the place to go. A wonderful place to stop, with wonderful hosts, and we would highly recommend. My son and I spent a week at Baia di Sorgeto and we were very pleased. It was everything it purported to be on HomeAway -- there are indeed two thermal pools and the accommodations are lovely and very comfortable. Not only that, but the location is great since it's only five minutes from the Bay of Sorgeto where hot water flows right into the ocean. We especially enjoyed our conversations with Peppino who is the consummate host, always helpful and friendly. Ischia is an island in the gulf of Naples in front of Capri. It can be reached by ferry (1 hour at a leisurely pace with stunning views) and hydrofoil (40mins high speed ride) from Naples: Beverello or Mergellina or Pozzuoli. Other Activities: excursions to Pompei, Vesuvio, Sorrento, Amalfi, Positano, Capri, Naples, Monte Epomeo.